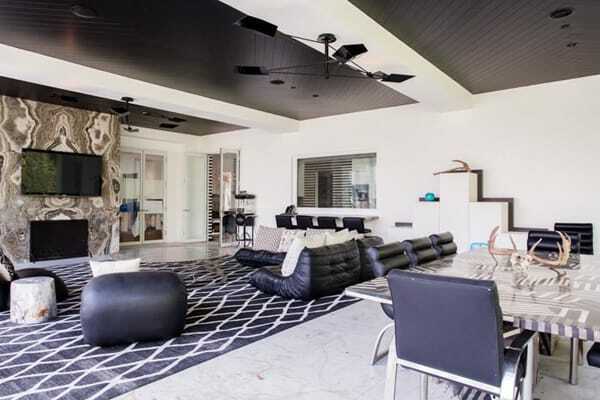 Musicians Gwen Stefani and Gavin Rossdale have always been known for their larger than life style, Gwen especially, so it’s no surprise that the mansion the couple shared in Beverly Hills reflects that. Celebrity interior designer Kelly Wearstler incorporated bold colors, graphic patterns, and a touch of Hollywood Regency flair to translate their unique style into a spectacular home. When the couple split up, they put the home on the market for a whopping $35 million and gave all of us the opportunity to take a peek inside at the opulent estate. The only thing more spectacular than the interior is the exterior, which overlooks breathtaking views. Enjoy this one-of-a-kind home tour courtesy of Pop Sugar. Vibrant red and white curtains surround this sitting room with pops of color for some personality, while all the white keeps your eye on the view. A bold pattern in the black and white flooring in the foyer creates a dynamic first impression. 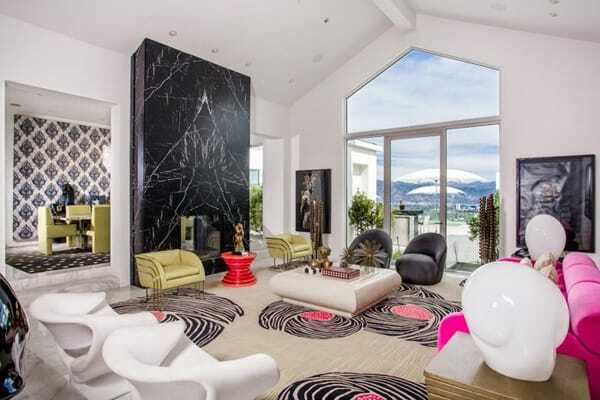 Hot pink accents the black and white living room with a black marble fireplace as the focal point. 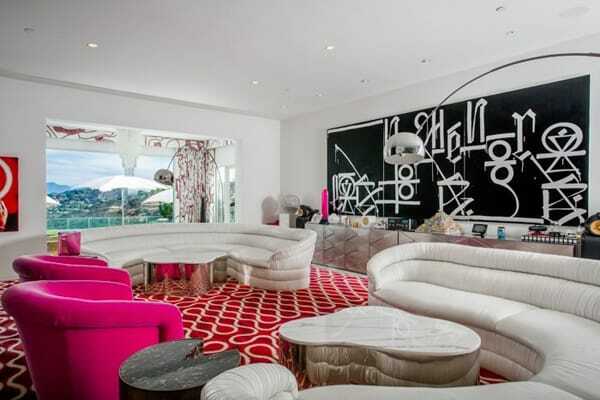 More hot pink takes on a larger role in another sitting area with custom-made sofas and more bold patterns. 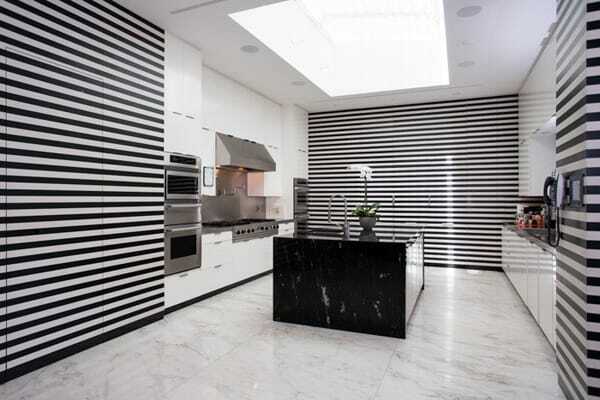 The kitchen is more streamlined than the rest of the home but still has a bold, artistic appeal thanks to the black and white stripes. The stripes continue into a dining area with a black leather banquette and modern chandelier. 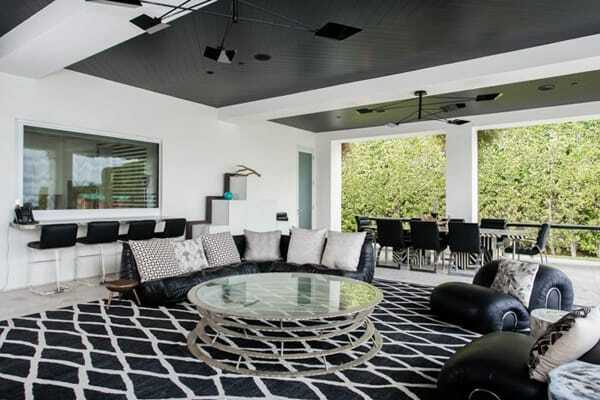 Outside, the color scheme is black and white with a large outdoor area rug, multiple living areas, and a black ceiling with white beams. Another angle of the outdoor space shows the pass-through window with bar stools. In the formal dining room, a wallpapered accent wall balances the marble fireplaces while a yellow dining room set pops in the middle. The outdoor sitting area is open to a stunning view, along with more seating on an uncovered patio. The master bedroom features a stunning accent wall behind the bed and a gorgeous view. How incredible is that fireplace? The master bathroom features more stunning tile and a sense of glamour. Another bedroom has a psychedelic bed that is complimented by white. The home gym features huge picture windows so you can take in the view while also enjoying the artistic decor in the form of black and white stripes and funky light fixtures. In the guest room, an angled bed and large windows allow the guest to take in the stunning views. At an outdoor kitchen, more stunning granite makes a statement.